Gangnam is a district full of the style and sensibility of Korea's youth. The Gangnam, Jamsil and Apgujeong areas that make up what we now call "Gangnam" ("South of the River") were commonly thought of as the outskirts of Seoul as recently as the 1980s, but now they are considered the heart of the city where one can see the Korean economic miracle---the Miracle on the Hangang River---in action. The epicenter of the trends shaping 21st century Korea and the sophisticated culture of Korea's youth, the Gangnam district is now one of the most visited destinations in Seoul for both local and international tourists. 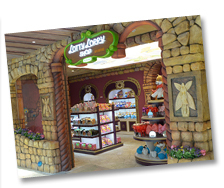 Lotte World is more than just an amusement park where you can enjoy all sorts of rides. 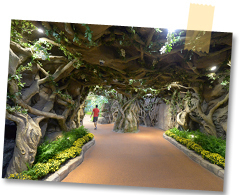 It a space where you can enjoy a wide range of experiences, including Underland, where you can experience the digital world; the Fantasy Forest, an ecological exhibit space; Kidstoria, which guides children through fairy tales; and even Pororo Park, a children's park based on the popular Korean animated character Pororo the Penguin. For couples and groups of friends, the leading attractions are rides like the GyroSwing, Comet Express, the Adventures of Sinbad, the French Revolution, the Flume Ride, the Spanish Pirate Ship, the GyroDrop, the Jungle Adventure and the Bungee Drop. 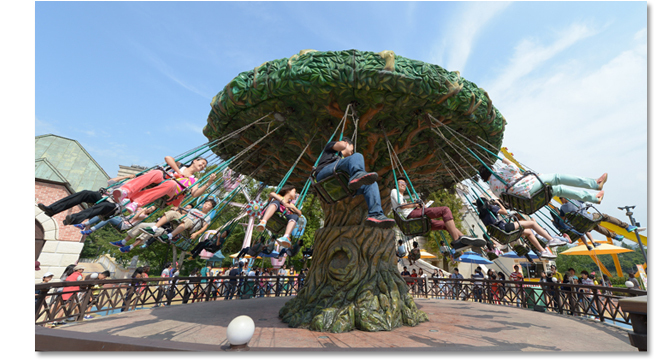 Families with children, however, could spend all day at Underland, the Fantasy Forest and Kidstoria. Lotte World will become an even more exciting place in 2014 when it adds a water park, aquarium and observatory platform. Business Hours : 9am to 11pm. Open 365 days a year. Days passes: KRW 48,000 (adults), KRW 42,000 (teens), KRW 38,000 (children), KRW 12,000 (babies). Admission only: KRW 33,000 (adults); KRW 30,000 (teens), KRW 27,000 (children). 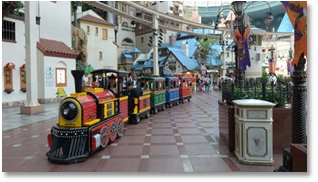 Adventure is an amusement park with rides that are fun for both adults and children. On the second floor you can find the French Revolution, a super-speed roller coaster that rotates from 360 to 540 degrees, and the kiddie favorite Bumper Cars. On the Third Floor are the water rapid ride Jungle Adventure and the World Monorail from which you can see all of Lotte World. On the fourth floor is the treasure hunt Pharaoh's Fury, Aeronauts Balloon Ride, the Dynamic Theater (complete with vibrating chairs), a cliff-climbing game, and a museum with 3D paintings. The Kid Zone has, as the name would suggest, a lot of fun stuff for children, including the fantasy play world Kidstoria, the bumper car ride Bumping Jesters, the children's car ride Boong Boong Car and the flying boat Eureka. Each floor of Adventure connects to different experience halls and rides. 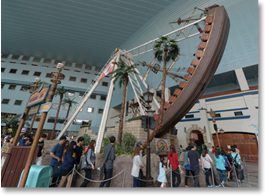 The second floor of Adventure is connected to the outdoor theme park Magic Island while the third floor is connected to the Lotte World Folk Museum. 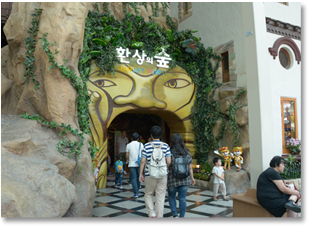 Opened in April 2014, Underland is the first thing you see when you enter the front entrance of Lotte World on the first basement floor. It is divided into the Media Zone and 4D Shooting Theater. In the Media Zone, you can use a touch pad to play football, or come face-to-face---so to speak---with a fish with your very face (provided you get your picture taken in front of the aquarium, that is). In the 4D Shooting Theater audiences can shoot up bad guys using a "Lotty gun" in a realistic 3D environment. There's a passageway connecting Underland to the first floor of Adventure. 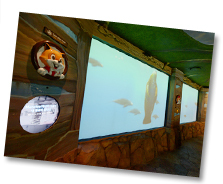 Located on the first floor, Fantasy Forest is an ecological experience hall that lets kids experience ecology in a new way. Kids experience the stories of the many insects and animals that live in the forest, including ants, grasshoppers, spiders, rabbits, squirrels and bats. They can observe not only life-like models of various insects, but also live specimens as well. The space is divided into sections---the Insect Zone, Animal Zone, Tree Observatory, Water Zone, Butterfly Zone, etc.---that provide unique ways to experience the insects and animals of the forest. The Forest lets you examine the homes of insects and animals up close and even has facilities that let you see the action as if under a magnifying glass. The House of Fairies has games and rides like slides, too. KRW 5,000 (same for adults, teens and children). KRW 2,000 for day pass holders. The fairy tale play world Kidstoria is a fun way to spend about 50 minutes. Reached by a slide, Kidstoria is a fantasy world with animal characters appearing out of nowhere and even a so-called "ball battle" game in which you use fake guns to shoot a giant ball. Children are also treated to a never-ending procession of tales, including Cinderella, Alice in Wonderland, the Three Bears and Aladdin. All parents need to do is sit back and watch their children have a good time. Admission : KRW 8,000 (same for adults, teens and children). Free for day pass holders. Sparkling under the natural light that floods in through the glass dome, Lotte World's ice rink offers year-round skating. It's one of Korea's largest ice rinks, capable of handling about 1,000 skaters simultaneously. It's got a larger surface than the world-class ice rink at Taereung---the training center for Korea's national athletes. 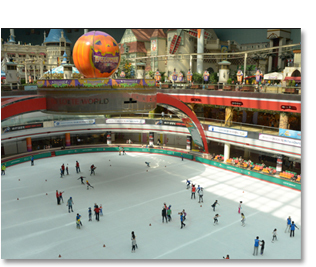 Despite being three floors below ground, there's nothing between it and Adventure's massive glass dome above, allowing for a brightly lit and cheerful skating experience. The rink is perfect for both romantic winter dates and beating the summer heat. As long as you're wearing safety equipment like helmets and gloves, anyone above the age of seven can enjoy the thrill of the ice. 11am to 10:30pm (weekdays), 10am to 10:30pm (weekends), July, August and December to February. 10am to 9:30pm (weekdays), 10am to 10:30pm (weekends), March to July and September to December. Admission only: KRW 11,000 (middle school students and above), KRW 10,000 (children). KRW 5,000 (individual), KRW 4,000 (groups). 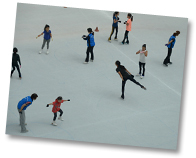 Set (admission and skate rental): KRW 16,000 (middle school students and above), KRW 15,000 (children). Asia's largest shopping mall, the COEX Mall is home to a massive bookshop, a Megabox multiplex theater and Korea's most popular aquarium, in addition to about 400 brand shops including cosmetics maker Etude House, accessory stores Clue and Accessorize, Dr. Martens, Levi's and more. There's plenty to eat, too, including global favorites like Starbucks, Burger King and Outback. It's best to plan out your route ahead of time---it's easy to loose your sense of direction in here. That's just how big the place is. 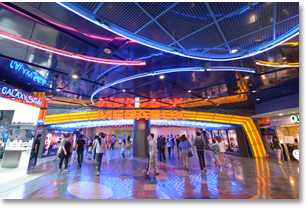 Getting There : You can enter the mall through Millennium Square, which is connected to Exit 5 or 6 of Samseong Station (Line 2). You can feel how special the aquarium is from the very entrance in the first floor basement. Throughout the place you'll find a variety of interesting and slightly eccentric tanks, acrylic tunnels through shark tanks and a rich variety of exhibits, including a fish exhibit halls and dioramas, tanks modeled on fish habitats, an "Amazonia World" with tropical fish, and a space with saltwater fish like mackerel and sardines. 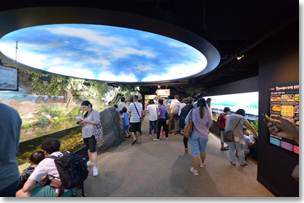 In the exhibit hall of the second basement floor there are numerous facilities, including the Kid's Aquarium, Mangrove and Beach, Seas of the World, Ocean Kingdom, Aquatic Mammals, Touch Pool, Deep Blue Square, Undersea Tunnel, Deep Blue Sea, and Penquins' Playground. 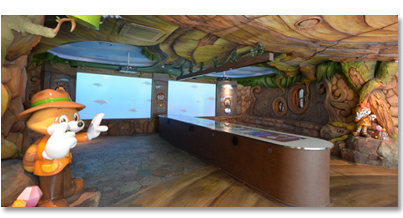 The Kid's Aquarium has got a variety of models and tanks kids will love. In particular, the Undersea Tunnel is perhaps the aquarium's best-recognized image. A moving walkway takes visitors along the glass tunnel, which passes through a giant fish tank. It's a fantastic experience that's like walking through the sea itself, taking you up-close-and-personal with a variety of aquatic life, including Jaws-like sand tiger sharks, packs of bluestripe snapper and giant shovelnose rays that seemingly fly through the water. This is COEX Aquarium at its finest. 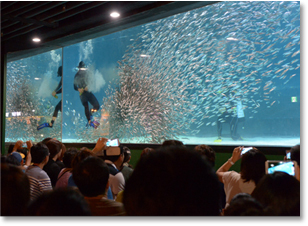 The aquarium also hosts programs in which visitors can feed some of the resident animals, including sardines, manatees, sharks, arapaima, seals, penguins and otters. This is a good chance for visitors to spend some time with lesser-known (at least in Korea) animals like the manatee and arapaima. Expect to spend about an hour and 40 minutes walking around the place. Business Hours : 10am to 8pm (admission ends at 7pm). Open 365 days a year. Admission : KRW 19,500 (adults), KRW 16,500 (middle school students), KRW 14,000 (children), KRW 16,500 (elderly). Families of three can buy passes for KRW 45,000, while families of four can buy them for KRW 57,000. As recently as the early 2000s, Apgujeong Rodeo Drive was a piece of fashionista holy ground that anybody even remotely concerned with fashion had to visit at least once. 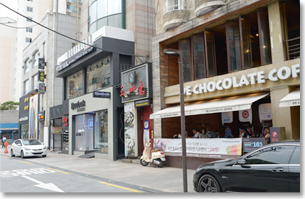 Due to the appearance of large-scale shopping malls in neighboring districts like Cheongam-dong Luxury Item Street and Sinsa-dong's Garosu-gil Street, however, it began to suffer a bit, but after a remodeling that began in 2009, the street has been on the upswing again. Many cafes have moved in, too. The area is now once again the Beverly Hills of Korea, and the "original" Gangnam Style is taking off once more. In the back streets of Rodeo Drive are boutiques featuring new brands and tailoring shops. Popular with the 20-something crowd is Reebok Classic Apgujeong, Asia's first Reebok Classic store. 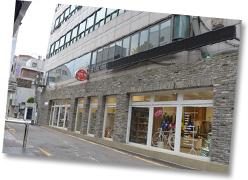 Opened in May 2013, LG fashion shop RAUM Edition features a variety of high-end European shoes such as French brand Bensimon, rain boot brand Hunter Boot and Norwegian brand Swims. The store helped bring shoe enthusiasts in their 20s and 30s back to Apgujeong Rodeo Drive. 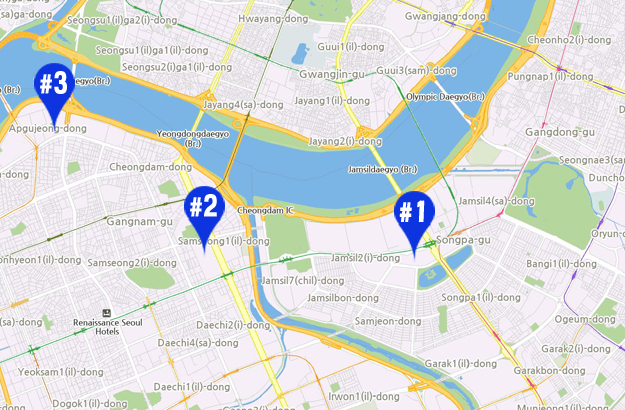 From Exit 5 of Apgujeongrodeo Station (Bundang Line), head straight and make a right at the first intersection. Cultural salon Pungwoldang turned Apgujeong Rodeo Drive into a place of culture and sophistication. 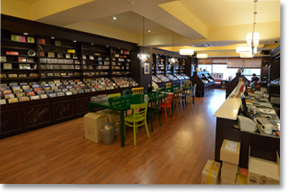 Selling high-quality albums for over a decade, Pungwoldang is home to one of the city's finest collections of classical music. It's even got its own academy. It's also a good place to get information on classical music performances. 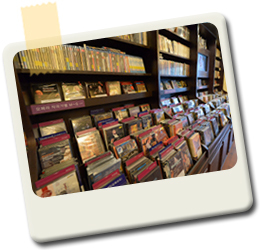 Check out the bookstore stocked with books on classical music, too. Business Hours : 12pm to 9pm. Closed Sundays. 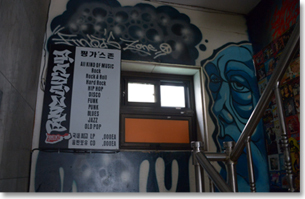 Nicknamed a "music library," the LP bar and Apgjujeong institution Finger Zone has watched over Apgjujeong Rodeo Drive for close to 15 years. It's a great place to take the edge off over some good music and a glass of your favorite firewater. The DJs will take requests (including the latest hit songs), while one corner of the bar looks like it's been displaced by the LP archive of an old radio station. The countless LPs that decorate the walls reportedly reflect the tastes of the owner. This place is very much an oasis, and many of the customers are regulars. Business Hours : 7pm to 4am. Closed on holidays.